The Smithsonian Libraries is currently recruiting for fall internships. We have four projects available – two in our Education department, one that is fully virtual and one that would be a fantastic experience for an aspiring science librarian. Below are additional details. We expect to close applications July 31st, 2018. Smithsonian Libraries Education Department is looking for a fall intern to further develop our family resources. Lead project will be building resources for Storytime program focused around our new exhibit. In addition, intern will assist with all teen and youth programming. Position is paid, part-time, with flexible work hours. 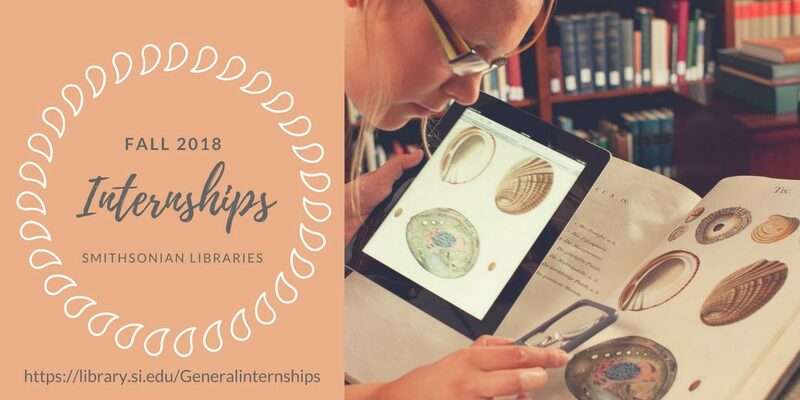 Through this experience, an intern can expect to develop and grow original educational content, gain project management skills and strengthen knowledge of museum and library collections. Ideal candidates for this position are Masters candidates in good standing in the following fields: Library Science, Education, Museum Education, Art History, History. Though all with applicable experience are welcome. The ideal candidate would be a high school student in good standing. The Biodiversity Heritage Library is the world’s largest open access digital library of natural history literature (http://biodiversitylibrary.org/). The BHL Digital Content Intern will work closely with the Digital Collections Manager to contribute digitized books and metadata to the BHL collection. Interns will learn various digitization workflow tools to track collection management and curation activities, enhance metadata, and process digital files for inclusion. Routine activities will include identifying key gaps in BHL’s collection, preparing digital books and catalog records for upload, adding descriptive item and page level metadata, ensuring copyright compliance and documenting workflow tasks. Ideal candidates will possess great attention to detail and a demonstrated ability to communicate proactively and work independently. Preference given to students with metadata or cataloging experience. Students enthusiastic to learn about collection management and curation in digital libraries are strongly encouraged to apply. The Natural & Physical Sciences Department of the Smithsonian Libraries (SIL) is seeking an intern to aid the department in the creation of a virtual version of its weekly in-person orientations. While in-person instruction sessions are convenient for some of the Smithsonian Institution’s (SI) staff, interns, volunteers, etc., the majority of people are not able to attend these sessions because of the geographically dispersed nature of everyone’s workplaces. In partnership with the Science Researcher Services Librarian, the intern for this project will translate the in-person sessions into an online experience that serves the diverse SI community. An internship of this nature provides the intern with an opportunity to learn about SI and SIL generally, and about the science libraries with more depth. The project will model and provide experience with the steps from exploration through implementation and testing of developing online pedagogical content for a diverse group of users. The ideal candidate will have a basic understanding of distance education technology, techniques and methods, and experience with developing short instructional videos that utilize screen capture techniques. Hello- Are internships only available to those who have access to SI’s Outlook? All links redirect to the Microsoft Outlook page.